Company: Japan Wind Development Co., Ltd.
Amidst growing concerns about the depletion of fossil fuels and the effects of climate changes caused by rising CO2 emissions and other factors, there is a growing push to generate power from wind, solar, biomass, and other renewable energy sources and thereby create a more sustainable society. Japan Wind Development Co., Ltd. (JWD) is a specialist in wind power generation technology with vast knowledge and expertise in this field. JWD is building and providing all necessary support services for a nationwide wind power generation network. In May 2008, JWD completed construction of a wind farm near Rokkasho village in Aomori Prefecture, in northern Honshu. This smart grid wind farm is the first facility of its type to use sodium sulfur (NAS) batteries to store electricity for supply to the national power grid. These batteries are charged at night, when the demand for power is lower, and the stored electricity can be supplied to the grid together with the electricity generated by the windmills during the daylight hours. This ensures a steady supply of power to the grid even during those periods when power production falls as the result of low wind speed. 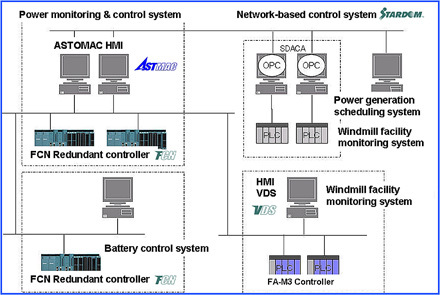 To control the transmission of power from the Rokkasho wind farm to the national power grid, Tokyo Densan, a Yokogawa representative and systems integrator, successfully installed STARDOM network-based controllers and FA-M3 range-free controllers. To ensure a stable supply of power to the national grid even when power production dips as the result of low wind speed, the Rokkasho wind farm utilizes large-capacity NAS batteries. 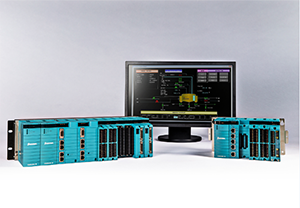 The STARDOM network-based control system and FA-M3 range-free controllers play an important role in smoothing out the supply of this power to the grid. A power monitoring & control system and a battery control system are both configured in the dual redundant STARDOM controllers. FA-M3 range-free controllers are utilized to monitor and control each windmill. 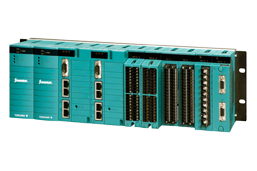 Controllers from other vendors are integrated with this system via an OPC interface. Factoring in the fluctuations in power production as a result of varying wind conditions, a power generation scheduling system calculates operation plan parameters and a power output pattern, based on which instructions are issued to each FA-M3 controller. The actual power output can be monitored on a trend graph. The operating status of each of the 34 windmills and the charge status for each of the 17 battery units can also be monitored together with various other types of operation data. Using the power generation scheduling system, operators can access the weekly operation plan data they need to draw up an operation plan for the next day. At their stations, operators can view graphic displays showing the power sales target, power generation plan, and battery charge-discharge plan. Operators can view data on total power output for the entire facility, battery charge status, and transformer operation status. For each windmill, data on power output, wind direction and speed, and operating status is displayed. For each battery, the charge-discharge rate, charge status, and operation status is displayed. Operations can also be monitored and controlled wherever network access is available. The integrated control system allows JWD to manage the operation of each of its windmills and provide a steady supply of power to the national power grid. JWD plans to begin constructing wind farms outside Japan, and to this end is working together with Yokogawa and Tokyo Densan to develop the necessary high-speed systems and equipment. Through this development of renewable energy facilities, JWD hopes to make a lasting and significant contribution to the building of a more sustainable society.